Having abandoned any attempt to join the Western global political order, Russia seems to have quickly found a new self-image: as the center and core of the Eurasian supercontinent, it can reach in all directions and provide a bridge between Europe and China on both ends. In this context, the Middle East has emerged as a central axis of Russia’s strategic concerns, perhaps for the first time in the country’s history. In his recent book What Is Russia Up To in the Middle East?, Dmitri Trenin shows how the Middle East was always marginal to Russian geopolitical interests. When progressing south, Russian military expansion had its eyes on the Balkans or Istanbul, in some periods extending to British India, Afghanistan or northern Iran, but a serious push beyond those areas was never considered. Against Ottoman Turkey, Russia waged twelve wars. It took the czarist army half a century to prevail over the mountaineers of the North Caucasus. Russia also conquered Central Asia and invaded Afghanistan, a military adventure that left little appetite for a return to the heart of the Muslim world. But neither the Russian Empire nor the Soviet Union had ever fought directly in Arab lands. In 2015, something genuinely new and unexpected took place. Russia stepped into the Syrian conflict. Any exercise considering what the Kremlin’s intentions and goals might have been has to start by noting how Syria offered a unique opportunity for promoting Russian strategic interests. By 2015 the United States had exhausted all choices there and showed signs of disinterest and disengagement. A Russian military intervention would constitute something of a revolution in global affairs. For the first time since the end of the Cold War, a country other than the United States would be projecting military force far away from its borders without consulting or involving Washington in the decision. Syria had never been considered important for Russian national interests, but in the new global landscape that would quickly change. After all, Syria was a critical issue for Turkey and Iran. The refugee crisis was affecting the European Union in powerful ways and China saw the Syrian corridor linking West and Central Asia to the Mediterranean as potentially decisive for the “Belt and Road” initiative, its project of trade and infrastructure development across the Eurasian supercontinent. With every other major actor reluctant to get involved in the Syrian civil war, Russia had an opening—not to solve the political and humanitarian crisis but to become the most important factor in any future solution. Once these initial elements were considered, more interesting possibilities started to appear. Between 2013 and 2015, the Russian economy had been under extreme pressure, not so much because of the sanctions imposed after the Ukraine crisis but as a result of the precipitous fall in energy prices. As a major oil and gas producer, Russia had neglected to prioritize energy geopolitics, paying a steep price for that. While China, highly dependent on inward energy flows, had spent decades extending its influence and leverage in Central Asia, Africa, and South America—preparing for all possibilities and diversifying energy supply routes—Russia knew it had more energy resources within its borders than it could ever need and customers were forever assured a more or less mechanical result of a growing and more balanced global economy. But that set of assumptions neglected how other producers can hit your interests by manipulating market prices. By 2015 the Kremlin was certain that the United States and Saudi Arabia were deliberately lowering oil market prices to squeeze Russia and Iran. With their budgets so highly dependent on oil revenues, Iran and Russia could be effectively pressured into limiting their expansionist agendas. One could even hope that they would become more inclined to abandon their nuclear ambitions, in the case of Iran, and aggressions against Ukraine, in the case of Russia. At the end of 2015, a 10 percent cut in public spending in Russia was the best evidence of the growing stress from the pincer movement of international sanctions and low energy prices in an economy that depends on crude at $100 a barrel. Faced with a direct challenge, Russia decided that the Middle East was now the arena where its future would be decided. In October 2017, Rosneft Chief Executive Officer Igor Sechin took the unusual step of presenting a geopolitical report on the “ideals of Eurasian integration” to an audience in Verona, Italy. One of the maps projected on the screen during the presentation showed the supercontinent—what Russian circles call “Greater Eurasia”—as divided between three main regions. For Sechin, the crucial division is not between Europe and Asia, but between regions of energy consumption and regions of energy production. The former are organized on the western and eastern edges of the supercontinent: Europe, including Turkey, and the Asia Pacific, including India. Between them we find three regions of energy production: Russia and the Arctic, the Caspian, and the Middle East. Interestingly, the map does not break these three regions apart, preferring to draw a delimitation line around all three. They are contiguous, thus forming a single bloc, at least from a purely geographic perspective. Sechin’s map has a number of other interesting elements. As noted already, Turkey is left on the European side of the line delimiting the energy production core in the west. The same is true for Ukraine, which although unavoidable in this context is still an unusual inclusion in a map sanctioned by the highest echelons of Russian state power. If one looks at the world through the prism of energy geopolitics, then Ukraine is a European country—a consumer, not a producer. Some of the most persistent foci of conflict in the contemporary world are located on the delimitation line between regions of energy production and energy consumption: eastern Ukraine, northern Iraq, Syria, Afghanistan, and North Korea. The fact may not be entirely coincidental. Many of these transition zones have become valuable prizes in the global fight for energy resources, with major powers often supporting rival internal factions in their bids for influence and control. In other cases, the “foci of conflict” are transit hubs for energy flows, determining who has control over them in case of future conflict. More interestingly, transition zones are often fault lines between different political and economic models. It seems to be the case, for example, that the attempt to create a form of personal rule in Syria in the absence of oil wealth created the need for sectarian politics. Sectarianism—the persistent promotion of mistrust and conflict between different ethnic or religious groups—functions as an alternative to oil, a form of compensation for the lack of oil resources such as those at the disposal of royal families of the Arab Gulf. It provides the ruling elite with a third method of obtaining consent from the governed, distinct from both oil patronage and the social rights of a developed democracy. Lost between two competing models, Syria has been unable to develop a genuinely stable variety of consensual politics. The map illustrates an important point about Russia’s new self-image. From the point of view of energy geopolitics, Europe and the Asia Pacific are perfectly equivalent, providing alternative sources of demand for energy resources. Russia has been struggling to abandon its traditional orientation toward Europe, hoping to benefit from the flexibility of being able to look both east and west to promote its interests. It seems that Sechin and Rosneft can place themselves in that position much more effortlessly. Sechin’s map subtly makes one final—and decisive—point. As you consider the three areas it delimits, it becomes apparent that two of them are already led and organized by a leading actor: Germany in the case of Europe and China for the Asia Pacific. Production chains within these highly industrial regions are increasingly managed by German or Chinese companies, which tend to reserve the higher value segments for themselves. Their spheres of influence extend to all important inputs, with one glaring exception: energy. In order to address this vulnerability, the two regions of energy consumption will be attracted to the core region, where they need to ensure ready and secure access to energy resources. And their efforts may well be made easier by the fact that the core region of energy production lacks a hegemon capable of ensuring its survival as an autonomous unit in the Eurasian system. One further and decisive factor must be mentioned here. As the United States drastically increased its oil and gas production over the last ten years—a result of the shale gas revolution—its role in global energy geopolitics started to shift. Two trends have become dominant. First, Washington no longer sees the Middle East as critically important for its safety and prosperity. What was a constant of American foreign policy for almost a century now seems open to revision. If domestic supply can now take the place of imports, the United States is less pressured to invest in peace and stability in the Middle East. It is not difficult to speculate that its response to the Syrian civil war would have been different—much more active and resolute—before the shale gas revolution. This fact naturally opened opportunities for Russia, already discussed above. Second, the new energy abundance in the United States might justify using energy as a geopolitical tool—steering energy flows and influencing market prices so as to reward friendly states and punish others. As we have seen, the Kremlin grew convinced that the United States was doing just that with regards to Russia and Iran. Attempts to use energy markets to drive geopolitical outcomes reinforced Russia’s conviction that it needed to acquire higher levels of dominance in global energy markets, pushing it to intervene more actively in the Middle East. It is from this perspective that Russia’s renewed interest in the region must be understood. By consolidating all three energy-producing regions under its leadership, Russia can take the decisive step in shaping the new Eurasian system. Its interests lie more decisively in organizing a common political will for the core region than in recovering the old dreams of integration with Europe. That the Syria military intervention is now regarded as a success—while the intervention in Ukraine led nowhere—may point to the fact that the former, but not the latter, took into account the facts of geopolitics. On the one hand, Russia feels at home in the Middle East. The pursuit of shifting goals against a background of persistent chaos or state disorder appeals to Russian strategic culture and its early success in Syria was quickly put to use. Suddenly Russia became an important interlocutor for every country in the region. Turkey, Iran, Saudi Arabia, Iraq, and Israel all have significant interests in Syria, so they all need Russia, the new effective overlord above Bashar Al-Assad. On the other hand, Russian leverage in Europe and China depends on the extent to which Moscow is able to increase its control over energy production. Efforts after 2013 to engage China as a growing destination for its energy exports suffered from the obvious difficulty that China had already developed a diversified pool of suppliers and was therefore in a position to dictate purchasing terms that Russia found unattractive. That a deal was finally reached with Saudi Arabia at the end of 2016 to collectively reduce oil production and give a boost to global oil prices is a direct result of Russia’s ability to influence decisions in the Middle East. Less than a year later, the agreement achieved its objective of raising oil prices to a level of $60 per barrel. King Salman’s visit to Russia in October 2017 was the first ever by a Saudi monarch. With Russia facing a new set of sanctions, Moscow now appears interested in exploring new sources of investment and capital. They may well include Saudi Arabia, following the announcement of more than $3 billion in potential investment deals upon the king’s visit. 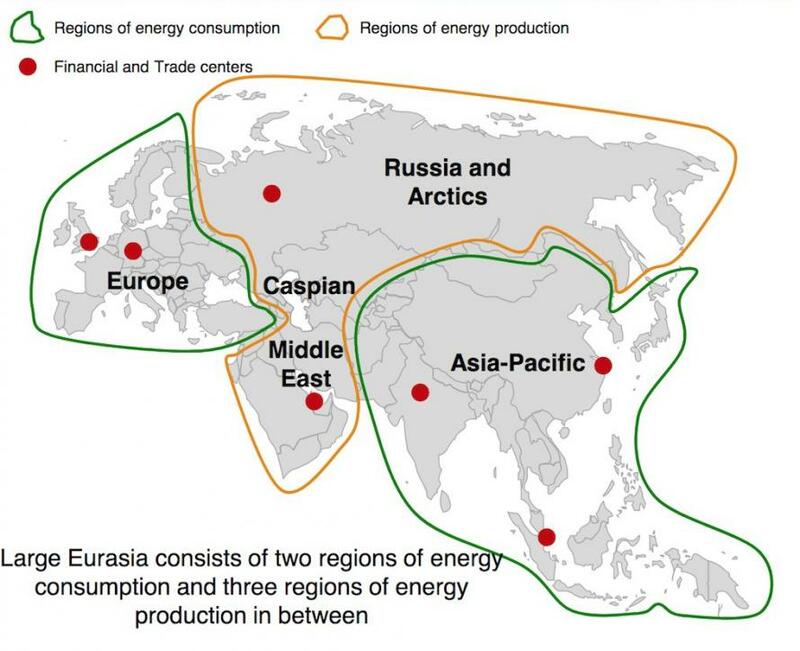 In two other maps, Sechin proceeded to show how energy projects offer the best example of Eurasian integration. Major companies from Europe, Russia, China and elsewhere typically pool capital and expertise, investing in exploration and refining projects from Scotland and Egypt to Vietnam and Indonesia. Eurasian integration implies the participation of energy consumers in energy production through investments in the shareholder capital of producers. Rosneft is a good example, with 50 percent of shares owned by the Russian state and stakes from BP, Qatar Investment Authority, Glencore, and CEFC China Energy. Moscow’s attempts to spread itself across the Middle East can be understood through a series of deals signed in the last two years. The oil and gas giant LUKOIL, the second largest company in Russia after Gazprom, is in negotiations to start production at the newly discovered Eridu field in Iraq. Gazprom Neft, Gazprom’s oil arm, has taken exploration blocks in Iraqi Kurdistan while also operating the Badra field in southern Iraq. 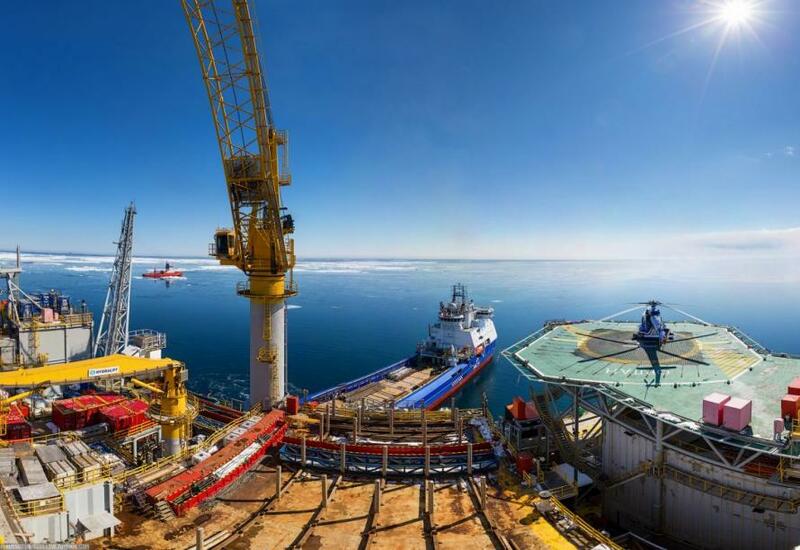 Rosneft has signed cooperation agreements in Kurdistan and Libya and has bought a 30 percent stake in Egypt’s giant Zohr offshore gas field. The very same day he delivered his speech on Eurasian geopolitics, Sechin announced that Rosneft would take control of Iraqi Kurdistan’s main oil pipeline, boosting its investment in the autonomous region to $3.5 billion, despite Baghdad’s military action sparked by a Kurdish vote for independence. The move helped shield Kurdistan from increasing pressure from Baghdad. Two weeks later, Sechin went on to sign a preliminary pact with the National Iranian Oil Company, the first step before a binding deal to participate in Iran’s oil and gas projects over the next few years, with investments totaling up to $30 billion and a production plateau of 55 million tons of oil per year. Four Russian oil companies have even begun negotiating for opportunities in Syria, a venture driven as much by politics as by commercial interest. The aim is not to explore and extract Syria’s modest petroleum reserves, of course. By actively participating in rebuilding and operating Syrian oil and gas infrastructure, Russian energy companies will be in control of a critical transit route for Iranian and Qatari oil and gas heading to Europe, bringing two rival producers closer to its orbit and tightening its stranglehold on the European gas supply. In 2009, Qatar proposed to run a natural gas pipeline through Syria and Turkey to Europe. Instead, Al-Assad forged a pact with Iran to build a pipeline from the Persian Gulf and then through Iraq and Syria and under the Mediterranean. This project had to be postponed because of the war. When it is resumed, Russia will be in control. It is in the very nature of the Eurasian system described by Sechin that the core energy production region—provided it is sufficiently united and organized—will benefit from its central position, being able to pick and choose between east and west in order to obtain the most favorable terms. Russia and the Middle East are now part of the same geopolitical unit. It took the Russian military intervention in Syria for the world to start to come to terms with this reality.